5G is pushing the boundaries of wireless communications and wireless device design. Significant innovations are needed in order to accommodate increased requirements for Enhanced Mobile Broadband, Massive Machine-Type Communications, and Ultra-Reliable Low Latency Communications. To meet these challenges, the wireless industry is exploring new technologies, such as multiple-input, multiple-output (MIMO) and beamforming, higher frequency bands including millimeter waves, and a number of changes to how base stations and devices are deployed and used. Remcom’s simulation products provide a complete solution, from system and antenna design through performance assessment in realistic, simulated environments, and planning for deployment in 5G networks. Our mission is to provide accurate solutions, optimized for performance to help our customers reliably predict how their systems will behave in the real world. Through active research and development, we have remained a leader in modeling and simulation technology for 5G and advanced wireless communications. Request pricing and a demonstration of Remcom’s 5G capabilities. Antenna engineers are increasingly developing advanced antenna systems capable of beam steering and multiple data stream transmission in order to meet throughput requirements for 5G. Designing such a device is a difficult task because of the many factors that affect a device’s performance. Remcom’s XFdtd enables in-depth analysis of a device's stand-alone performance, with 5G device design features that support high frequency array antennas. Wireless InSite can be used to assess device performance in realistic indoor or outdoor environments, including scenarios rich in multipath and varying channel characteristics. New features support MIMO, including Massive MIMO beamforming and diversity techniques, and millimeter wave systems. Used together, these products help engineers design and assess their antennas and devices and predict their performance in 5G network environments. Read more about XF's and Wireless InSite's complementary features for 5G MIMO and array design. Urban small cells are one of the most challenging scenarios for simulation of performance for 5G. Network densification, whether for increased capacity or to deal with millimeter wave propagation challenges, leads to much more complex urban multipath conditions. 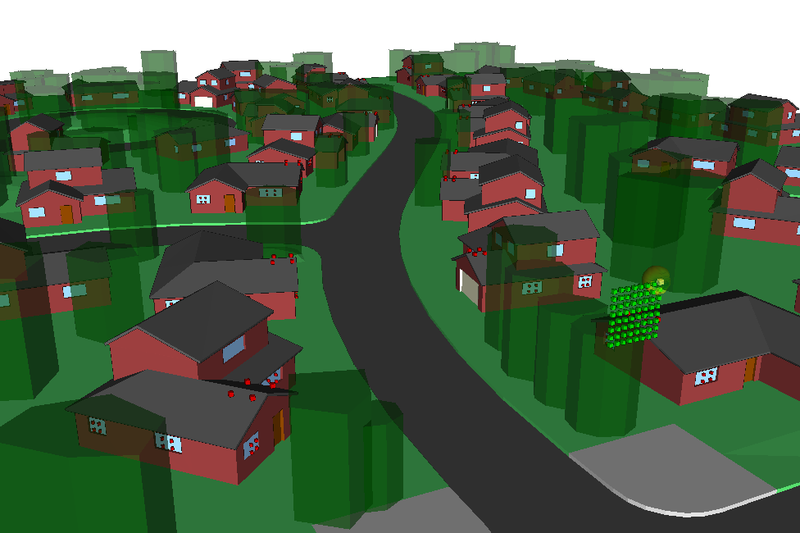 Wireless InSite provides a unique ray-tracing solution that not only captures the detailed multipath, but also enhances this with accurate prediction of the spatial variation of fields, polarization, and phase, even over small scales across a millimeter wave MIMO array, offering a unique capability for predictive simulation. Read more about Wireless InSite's capabilities for 5G Urban Small Cell analysis. Fixed Wireless Access (FWA) is one of the early planned use cases for 5G deployment, offering a new wireless alternative for providing broadband to homes and businesses. There are many new challenges posed by the scenarios where this will be used, often in suburban neighborhoods, where trees and winding roads combine with the likely use of millimeter wave frequencies to complicate planning and coverage. Wireless InSite provides a number of features and capabilities that are critical for understanding the nature of these scenarios. Read more about Wireless InSite's capabilities for 5G Fixed Wireless Access analysis. Indoor applications provide a number of new scenarios for 5G and Wi-Fi that will require higher bandwidth, higher throughput, and propagation in increasingly complex indoor environments. Typical use cases where Remcom’s tools can simulate performance include HD video within a room, communications within stadium environments, and industrial automation. Although the physical environment is very different, some of the same challenges exist, including the use of MIMO antennas and techniques, propagation of millimeter waves, and complex environments, where walls and furniture result in significant multipath and scattering. 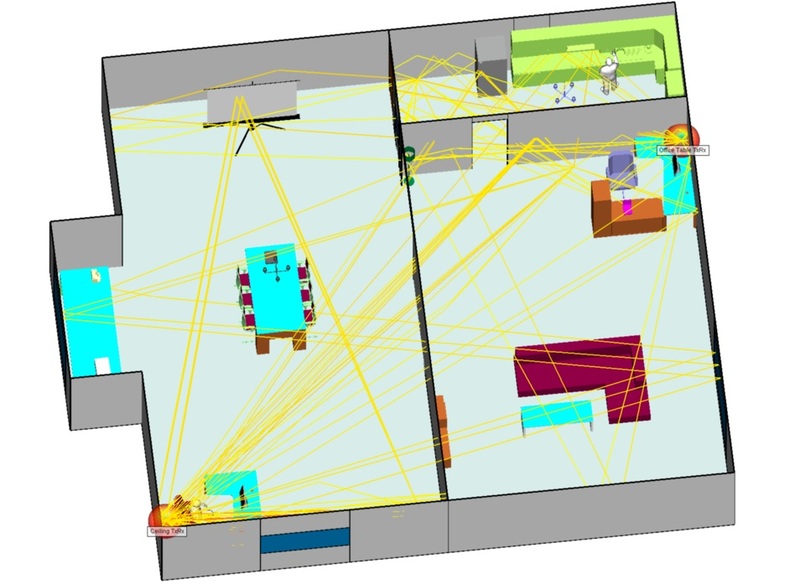 Wireless InSite accurately predicts multipath effects in indoor environments, offering a powerful tool for detailed simulation of channel characteristics. It also has a number of enhancements for millimeter waves, including the effects of absorption and scattering at 60 GHz, the losses incurred from propagation through walls, and the intense multipath caused by interactions with surfaces and furniture within office environments. Read more about 5G mmWave indoor channel modeling.